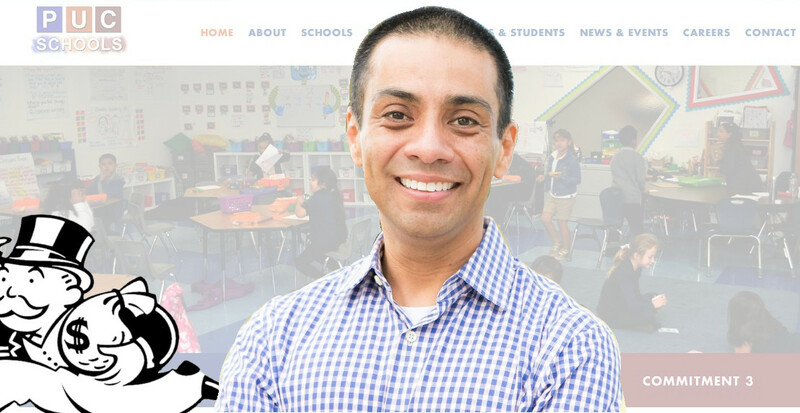 Ref Rodriguez ran a big-money campaign to be the first representative of a charter school to be elected to LA's public school board; the money came from the deep-pocketed investors in charter schools, and was criminally laundered with Rodriguez's help and led to him being made president of LA's board of ed. LA leads the country in charter schools and charter school enrollments, and these schools cost way more and teach way less than the public system they are slowly starving of funds. Without massive and misleading PR campaigns, these commercial entities (funded with public money) would be empty. So it's not surprising that a cheating parallel school system would cheat to get its man on the board of ed. After Rodriguez was charged with three felonies and 25 misdemeanors, he pleaded guilty, agreed to pay back $100,000 (along with his co-defendant Elizabeth Melendrez) and admitted that he "engaged in money laundering to further his 2015 campaign for a seat on the Los Angeles Unified School District Board of Education." The legal troubles for Rodriquez are not necessarily over. Sources tell The Times that the U.S. attorney’s office has looked into unrelated conflict-of-interest allegations against Rodriguez.